Johnston County public school students from Corinth Holders, Princeton, and Smithfield-Selma high schools volunteer with “The Bicycle Man” in Cumberland County through a service work-based learning opportunity. “The Bicycle Man” is a non-profit organization that receives bicycle donations throughout the year and matches them with children in Cumberland County School s during the Christmas season. The children who receive the bicycles are identified through their school’s social worker. 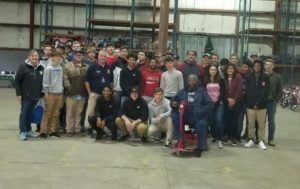 A total of 32 students from the Auto I and II classes at Corinth Holders, Princeton and Smithfield Selma high schools volunteered by repairing, tearing down, and putting training wheels on the bicycles on Nov. 14. These students serviced approximately 30 bicycles, cleaned the warehouse, and re-organized it to store more bikes. Many of the bikes were sorted to determine if they could be salvaged or not. The volunteer work was facilitated by Cindy Allen, the Career Development Coordinator at SSHS. Allen worked with CHHS automotive teacher Jimmy Massey, PHHS automotive teacher Terry Braswell, SSHS and automotive teacher Garry Allen to coordinate the student’s volunteer work. Ann Mathis, “The Bicycle Man” CEO, said she was appreciative of the volunteer efforts and the holiday spirit demonstrated by the schools. Associate Superintendent for Cumberland County Schools Tim Kinlaw and Cumberland County Commissioner Larry Lancaster visited with the students while they were working on the bikes. They expressed their gratitude for students from another county coming to help those in Cumberland County. The students said they truly enjoyed making a difference for other students through the service work-based learning opportunity, and they hope to be make the volunteer work an annual event.